On the summit of Segla, across the fjord from the fishing village of Mefjordvær and the Senja Lodge, our home for a couple of days. [Christy here] No one really knew what to expect when we made the drive north from the Lofoten Islands to Senja Island, but after spending a couple of days in the small, charming fishing village of Mefjordvær on the Northwest coast of Norway’s second biggest island, we left we all agreed there was something truly magical about the place. 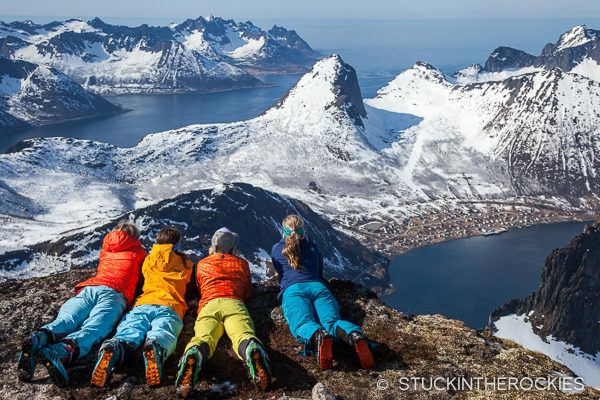 This beautiful and idyllic island is a must-see for those thinking of skiing in Norway. 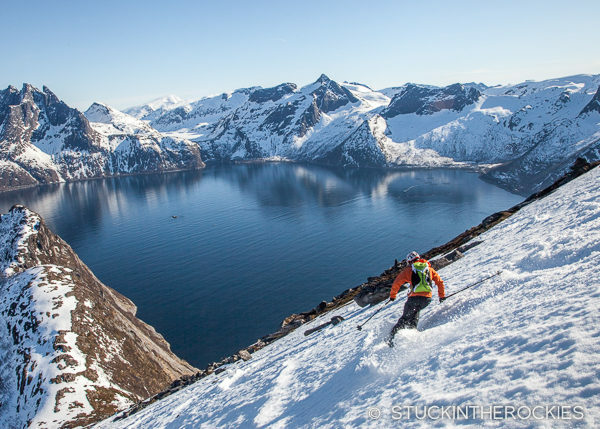 Not only is it filled with dreamlike terrain and adventures, it is also home to white sandy beaches, Ånderdalen National Park, (located in the southern half of the island), and the world’s largest troll. The coast seemed to be torn and split by numerous small fjords and rugged mountains that rose straight from the sea. The backside of many of these peaks offered more mellow snow covered slopes and big basins that made for an enormous skier’s playground. 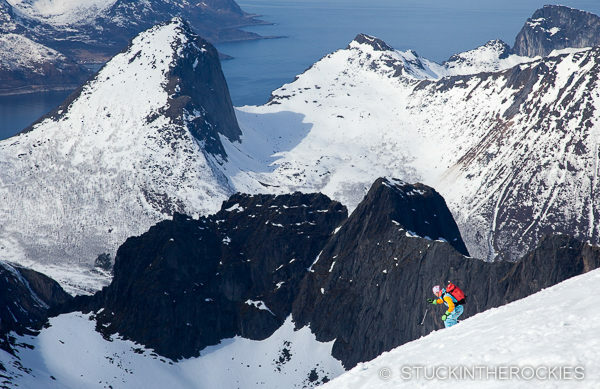 The Senja Lodge was a skier’s dream pad and is the perfect place to stay if you’re ever in Senja. Our base camp for the next couple days would be the well-designed and cozy Senja Lodge, which we had all to ourselves. 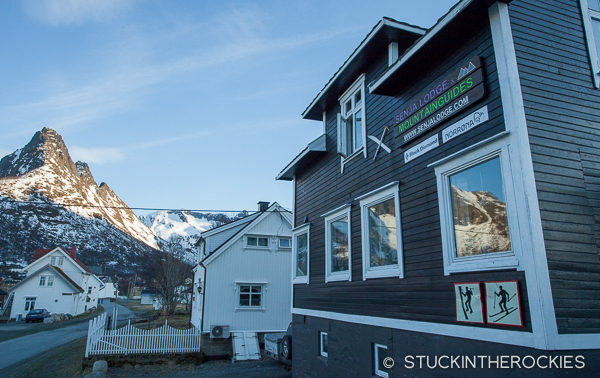 Once a place for passing fisherman, the skier and climber guesthouse was just a quick drive from the islands most prominent mountains and amazing ski terrain. 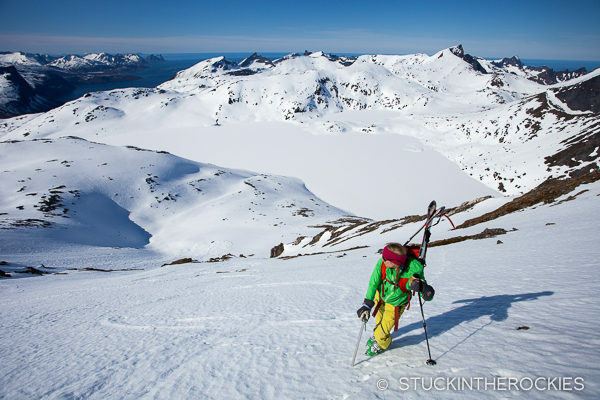 Armed with the Ski Touring in Norway guidebook and some local beta, our first day we opted for a few peaks that would provide the most scenic views so that we could get acquainted with our new location. 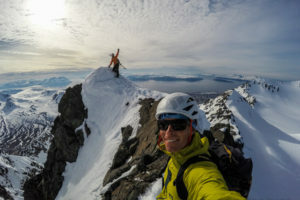 Lucky for us this meant getting in three summits, all with spectacular views of the fjords below us, Keipen, Grytetippen, and a local’s favorite Segla, appropriately nicknamed The Shield. 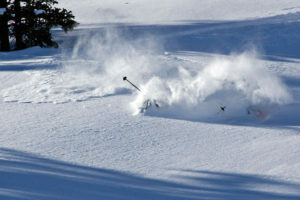 Anda, fired up to ski, with several dozen skiers from Tromso getting ready to follow suit. 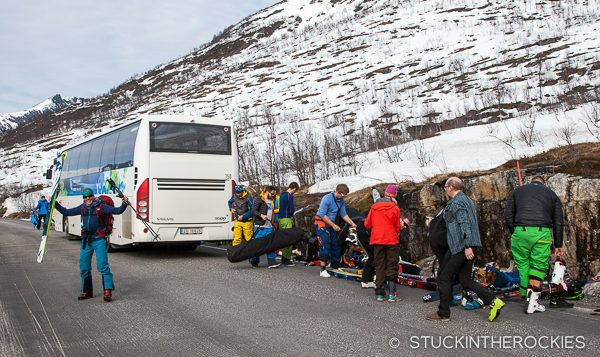 As we readied to skin, a sightseeing tour bus pulled up to where we had parked and to our amazement unloaded about 50 ski tourers with a similar plan to ours. We definitely weren’t in Colorado anymore. 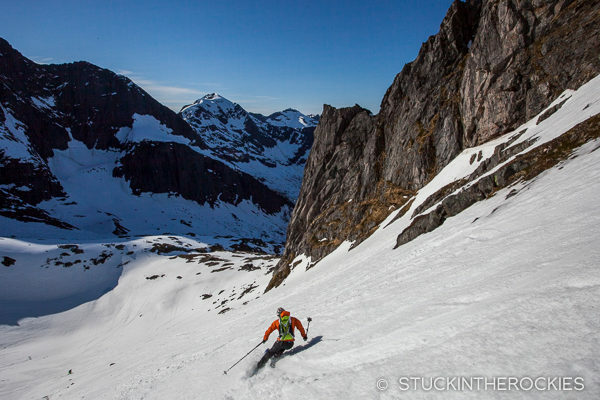 Kir skiing Keipen, the tallest mountain in Senja at 938m. Segla, or The Shield as it’s called, is in the background and was our third peak of the day. 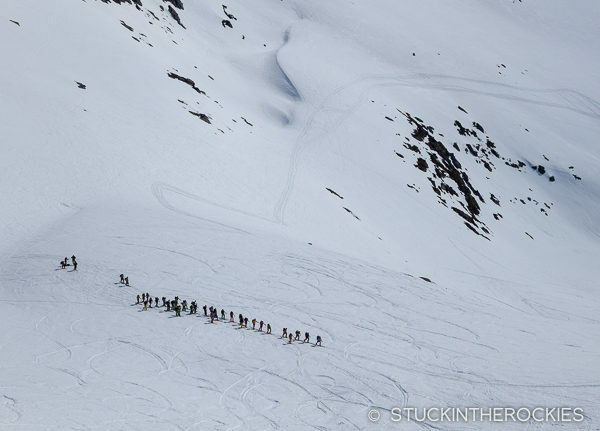 Looking down at the Tromso ski tourers on their way up. Soaking in the view on the second summit of the day, Grytetippen, 885 m.
Max skiing Segla in the afternoon light. 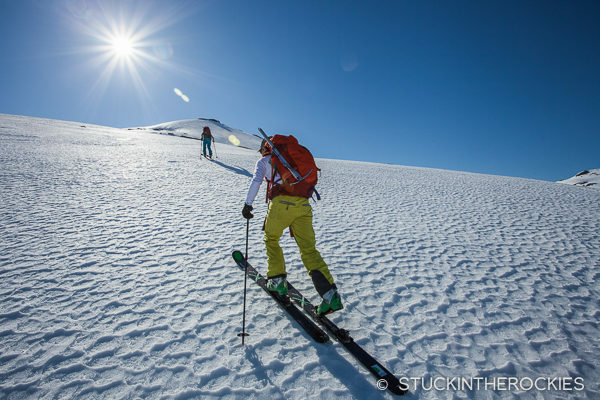 The next day we were able to ski three more of the Island’s classic peaks, spending the entire day up high and skiing from one peak to the next. With the help of a short car shuttle through one of Senja’s small rocky tunnels, we did a point-to-point linkup of Store Hesten, Roalden, and Burstinden. Heading up Store Hesten (meaning big horse) at 874m. Another splitter day in Senja! 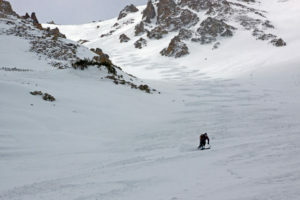 We climbed and skied the West Face couloirs on Store Hesten. 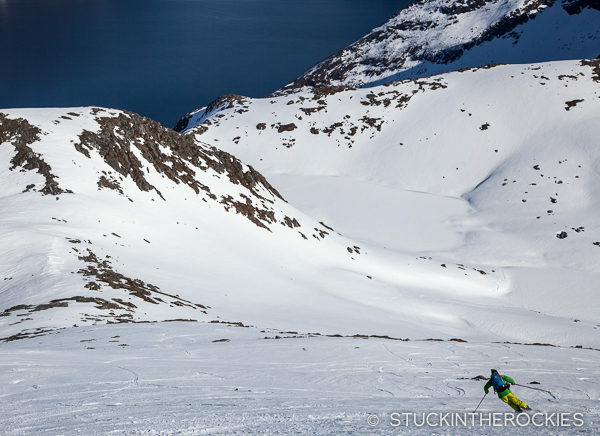 After skiing back down we crossed the frozen lake and headed towards the peaks out in the background for two more descents before leaving the island and driving north to the Lyngen Alps. 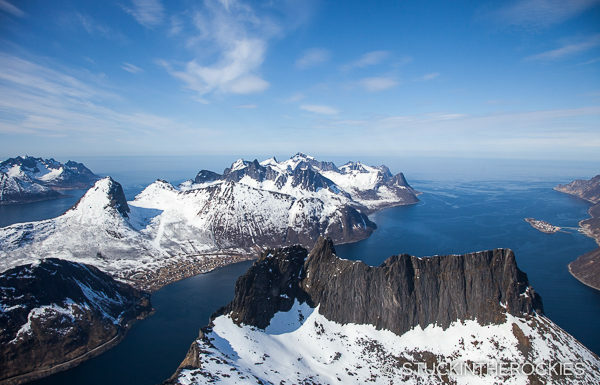 Senja Island had an unusually large amount of Rype, as they’re known to the Norwegians. 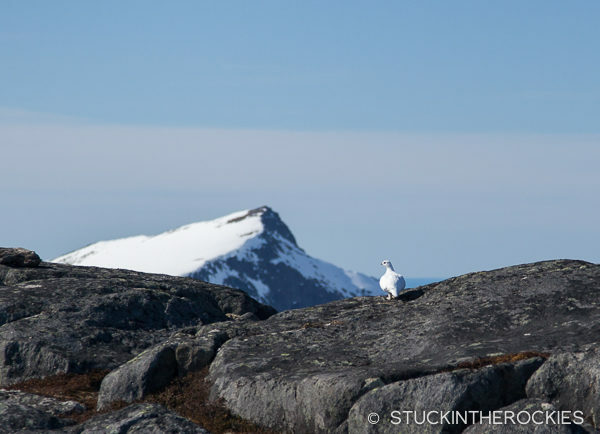 The Rock Ptarmigan is native to the Arctic and mountain habitats across Eurasia and North America. 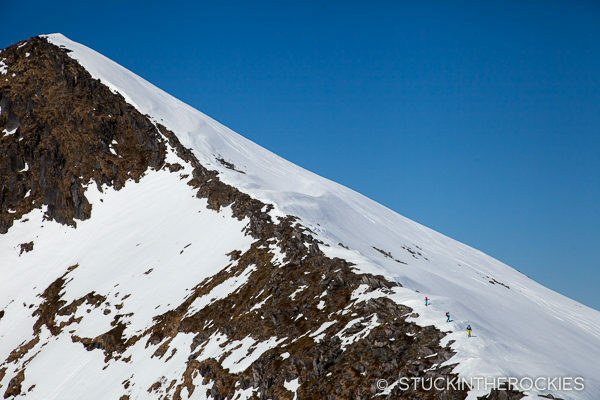 Three amigos…Penn, Kir, and Anda climbing Roalden. Penn enjoying the East Face of Roalden. 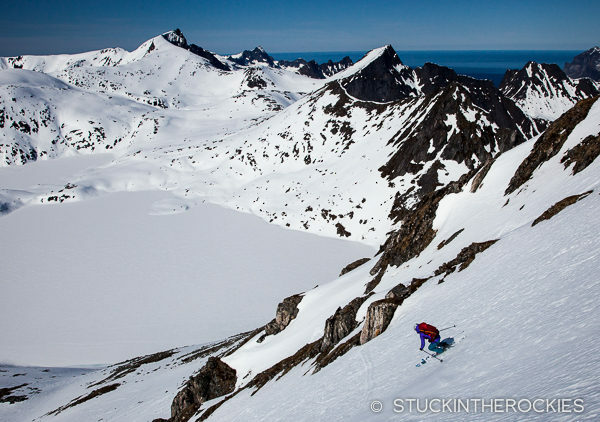 We wrapped up the day skiing the west side of Burstinden, 753m. After another full day of snow and sun it was time to say farewell to Senja and make the trip north to the Lyngen Alps. 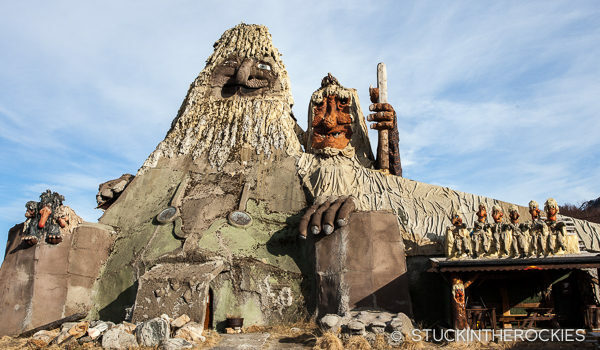 The Senja Troll measures 18 meters and is based on an old Senja legend of a troll which was seen both from land and sea. 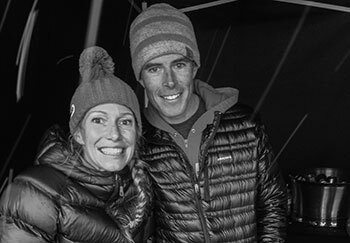 Next stop, the Lyngen Alps! Our last stop on our Norway trip was to the Lyngen Alps, a peninsula packed with peaks a short distance north of Tromso. 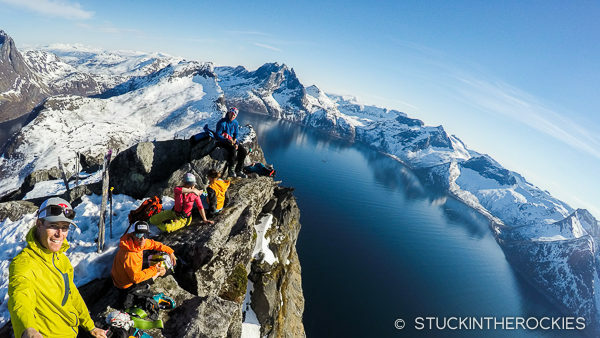 We had long heard of the region, it’s one of the more well-known locations in Northern Norway for climbing and skiing.